Ahmed Hassan Zewail (born in Damanhur, Egypt) is an Egyptian American chemist, and the winner of the 1999 Nobel Prize in Chemistry for his work on femtochemistry. He was brought up in Disuq, and received his first degree from the University of Alexandria before moving to the United States to obtaine his PhD at the University of Pennsylvania. After some post doctorate work at the University of California, Berkeley, he was awarded a faculty appointment at Caltech in 1976, where he has remained ever since. Zewail's key work has been as the pioneer of femtochemistry—i.e. the study of chemical reactions across femtoseconds. Using a rapid ultrafast laser technique (consisting of ultrashort laser flashes), the technique allows the description of reactions on very short time scales - short enough to analyze transition states in selected chemical reactions. 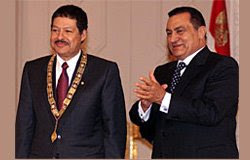 In 1999, Zewail became the third Egyptian to receive the Nobel Prize, following Anwar Sadat (1978 in Peace) and Naguib Mahfouz (1988 in Literature). Cambridge University awarded him an Honorary Doctorate in Science in 2006.